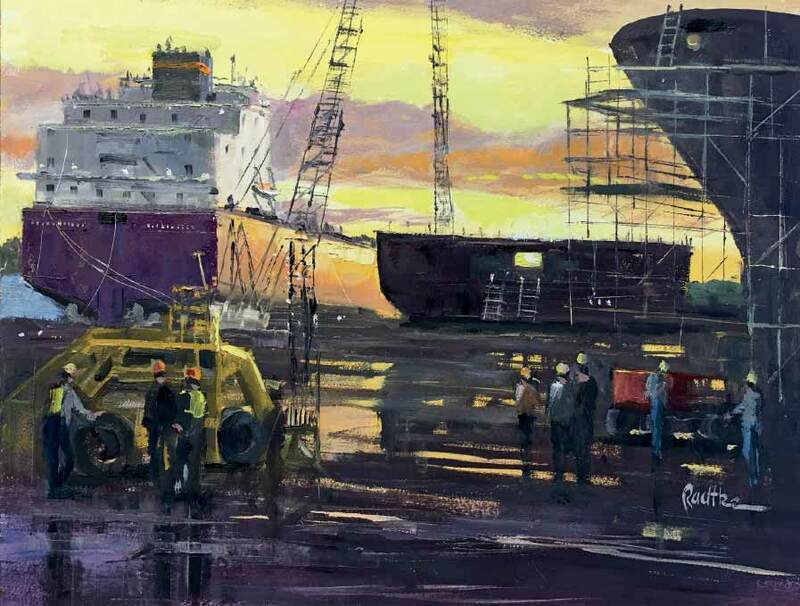 Octogenarian and local fine artist Lee Radtke is just getting started on his bucket list. Lee Radtke knew at an early age that he loved to draw—a lot. He started out sketching his own imagined cars of the future. 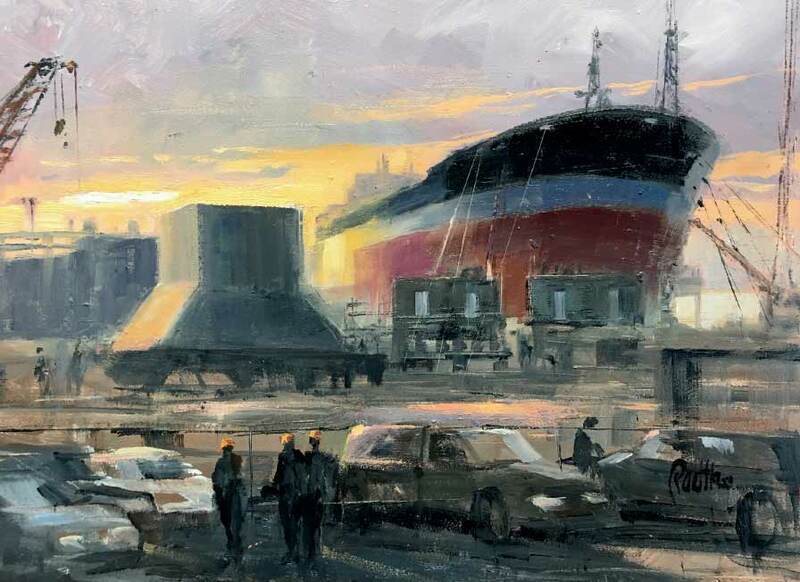 Much later in life, he would paint exotic cars, freighter boats, and cityscapes. But first came education and life. 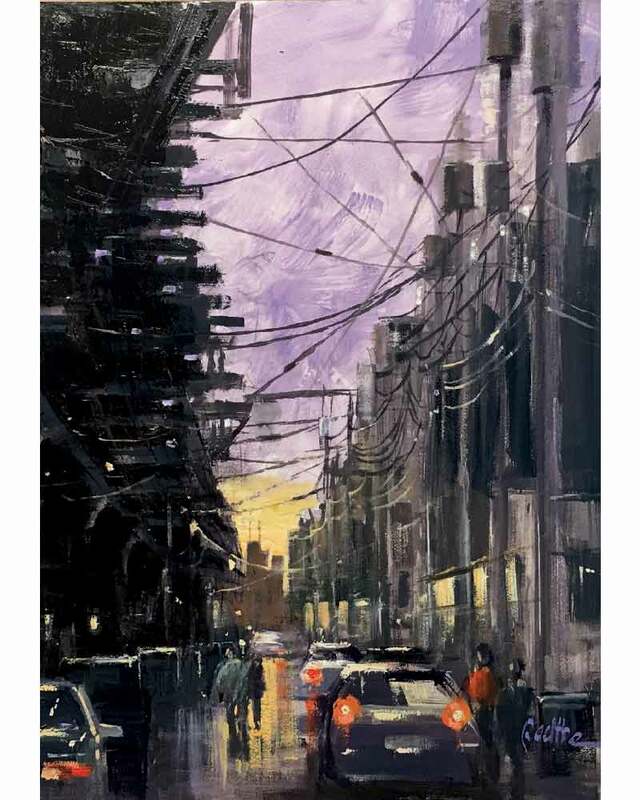 Unlike many would-be artists who go on to practical careers in business or other non-creative fields, Radtke chose an art major while attending high school in the Logan Square neighborhood of Chicago, where his art teacher Mrs. Adams encouraged him. He also took summer classes at the Art Institute of Chicago and then went on to earn a bachelor’s degree in product design at the Institute of Design. Radtke married his wife Barbara nearly 60 years ago and raised their two children in nearby Lake Zurich, where they’ve lived for 40 years. And, after retiring in 2000, he decided to pursue fine art. “I started to draw again more seriously and to paint,” he says. “While I never had any training in fine art, it was always on my bucket list. I started out painting with the Plein Air Painters of Chicago, meeting at a different location every Saturday morning. That’s where the passion developed”—along with his knack for and talent in impressionistic oil painting. “I prefer oil painting because it is very forgiving; you can scrape off or paint over,” Radtke explains. 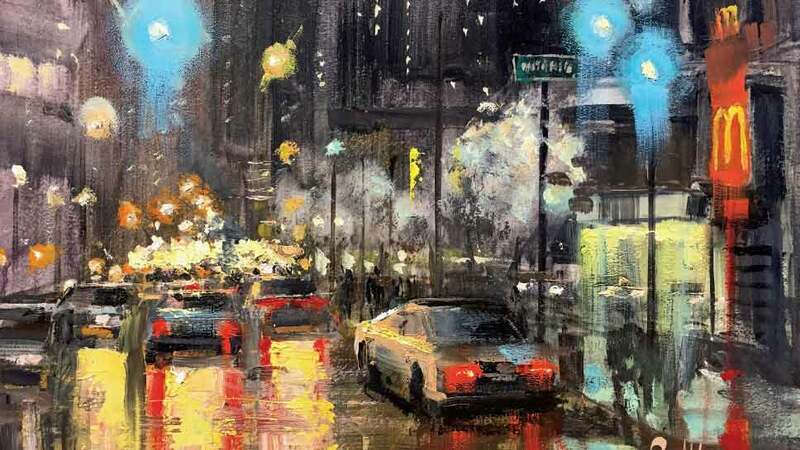 He painted a lot of cityscapes at first, iconic Chicago locations ranging from the Art Institute and Millennial Park to Market Street, Humboldt Park, Bucktown, and Lincoln Park. “But I was not satisfied with one subject matter,” Radtke explains. “I like to try other things and challenge myself.” That’s where the exotic cars and Sturgeon Bay ships come in. “It’s been an exceptional year,” he says with pride. Radtke is also proud to call himself a member of numerous arts organizations, both local and national: Oil Painters of America; American Impressionist Society; Plein Air Painters of Chicago; Barrington Cultural Arts Center; and Lake County Art League, where he paints “plein air” with the Lake County Art League under the guidance of Chris Tanner who scouts locations such as the Fox River Marina in North Barrington, the Civil War reenactment site in Wauconda, and area forest preserves. Radtke has shown at numerous other shows including: Art in the Barn, Barrington; Art in the Park; Prairie Crossing Art Fair; 57th Street Art Fair and Old Town Art Fair in Chicago; Art on the Square Lake Forest; OPA Salon Show and Eastern Regional Exhibition of Traditional Oils, both in 2017; and AIS 2017 Small Works Show and the 18th Annual National Juried Exhibition in 2017. He also has many Door County paintings on display at Door Guide Publishing in Sister Bay, Wisconsin. He has also won numerous awards. 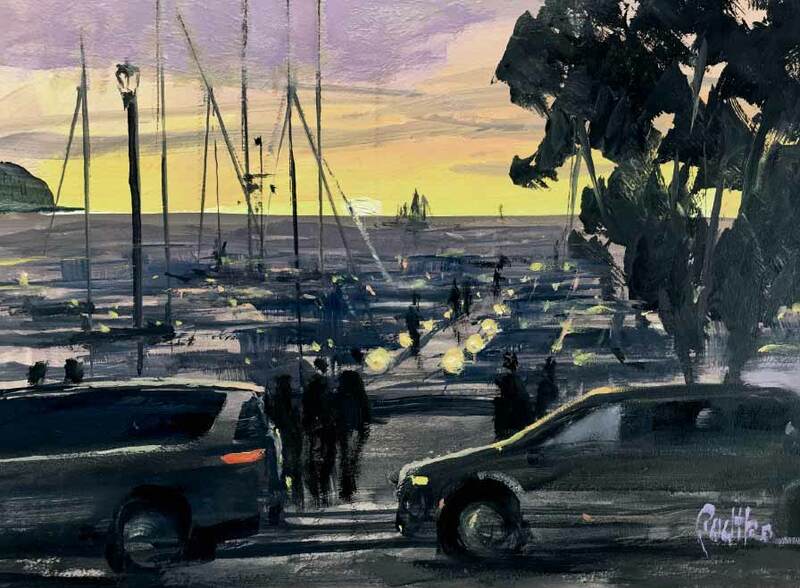 Most recently, he earned First Place (in the Wet Paint competition) at the 2018 OPA Regional Salon in Traverse City, Michigan in June. 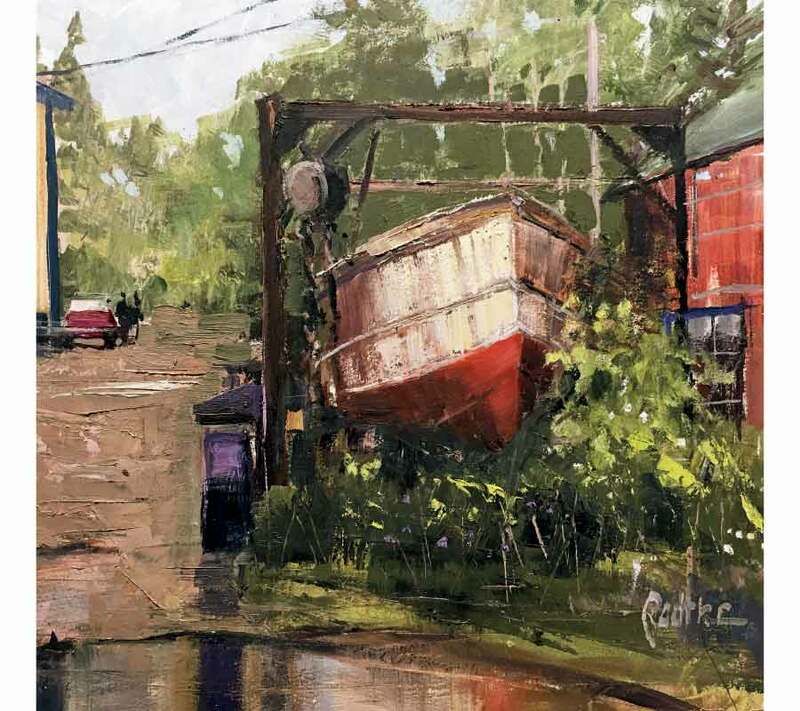 He was also named Quick Paint Honorable Mention at Woodstock Plein Air in 2016; 1st Place in the Historic Category at Cedarburg in 2015; and Honorable Mention at Cedarburg 2016, and Best of Show at Art in Nature in 2016, among others. For more information, visit radtkeart.com.